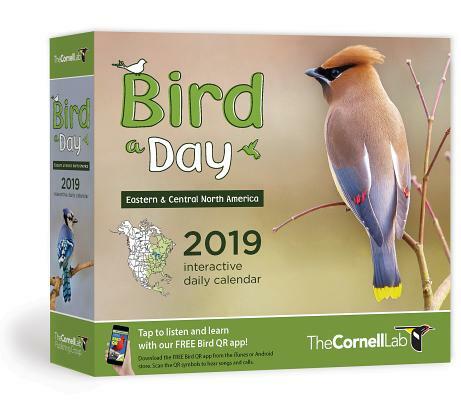 The Bird-A-Day 2019 interactive daily calendar, designed by the Cornell Lab especially for bird lovers, is unlike any other bird calendar. Bird-A-Day is the only page-a-day desk calendar series that showcases birds regionally, just like our field guides (one version for bird lovers in Eastern / Central North America, and a second version for bird lovers that live in Western North America). Both Bird-A-Day calendars include gorgeous photographs of common birds from professional and amateur bird photographers, and each page. features the latest range map, easy reference icons for habitat, food, nesting, and behavior, and fascinating and informative fun facts. We also share special bird and conservation events throughout the year with back-of-page content, and weekend "Get out there and go bird watching " ideas and activities, including some of our best bird watching advice and tips from the Cornell Lab. And of course, Bird-A-Day is fully compatible with our free downloadable BIRD QR app so you can listen to HD bird sounds for each species. NEW for 2019, we've enlarged photos on the front of each species page by 50% (bird lovers LOVE great photos of birds), moving the map and species info (and added lots more ) to the back in color. Wherever you live across North America, Bird-A-Day is the definitive daily calendar for bird lovers. As with all Cornell Lab Publishing Group books, a portion of net proceeds from the sale of this title goes directly to the Cornell Lab to support projects such as children's educational and community programs. The Cornell Lab of Ornithology is a world leader in the study, appreciation, and conservation of birds. Its hallmarks are scientific excellence and technological innovation to advance the understanding of nature and to engage people of all ages in learning about birds and protecting the planet.Founded in 1915, the Cornell Lab is a nonprofit organization with a vibrant community that includes 400,000 citizen-science participants from all walks of life and 14 million bird enthusiasts of all ages who connect online at All About Birds.A portion of net proceeds from Cornell Lab Publishing Group books go directly to support the Cornell Lab, including children's educational and community programs.